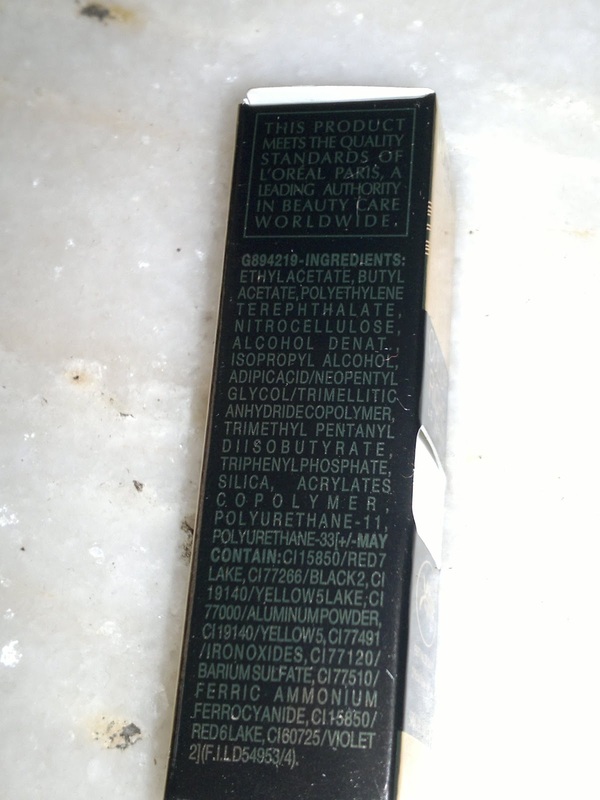 Price: INR 235 for 5 ml of the product. 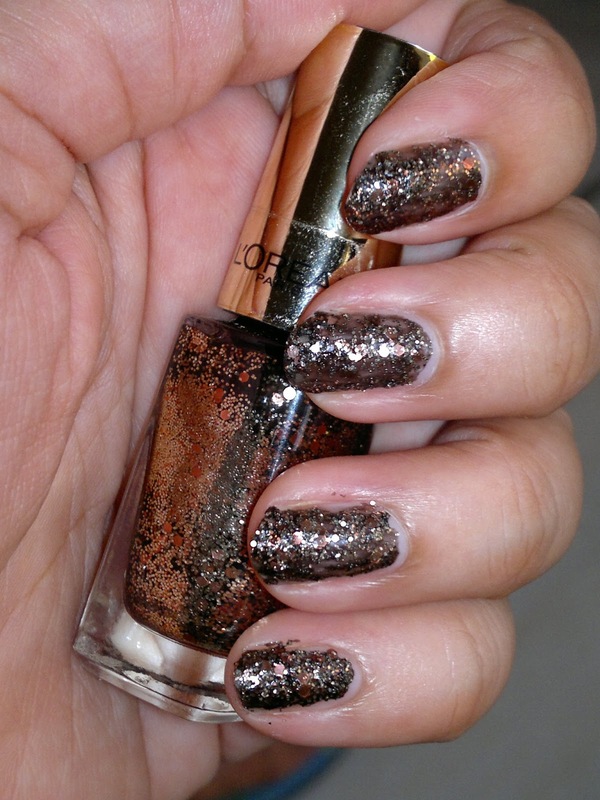 The packaging of this nail paint is so gorgeous and luxurious. I couldn't even bring myself to throwaway the outer carton, which is all golden and black with beautifully encrypted letters. Full marks to L'oreal for the excellent packaging. 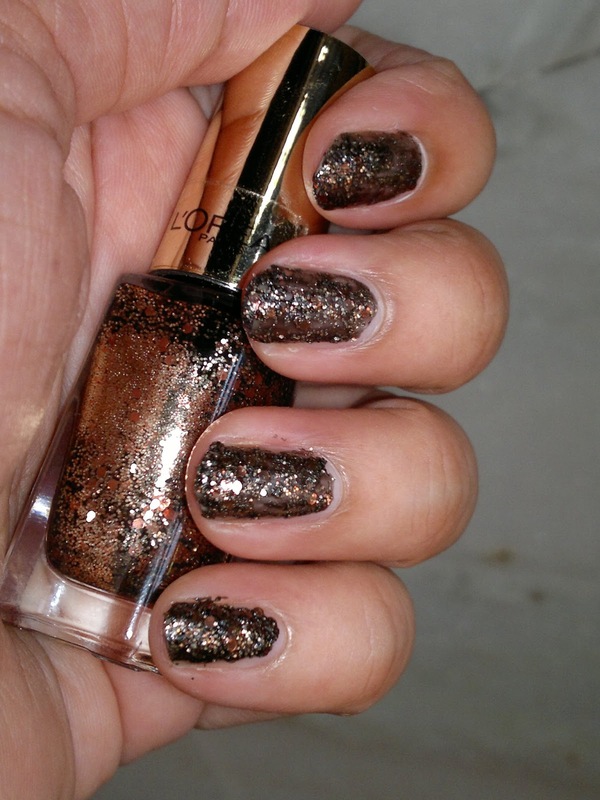 The nail paint is densely packed with golden and coppery glitters in a black base. The nail paint is pretty easy to apply (quick tip: apply thicker coats). 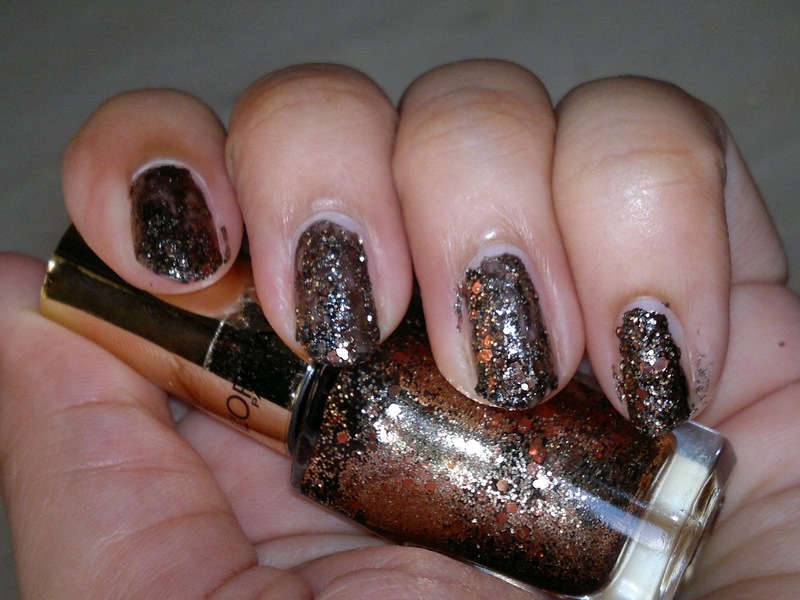 There is no need to do any glitter placement, the glitters get evenly distributed on their own as the nail paint is jam packed with them. The black base offers a pretty contrast to the golden and copper glitters. 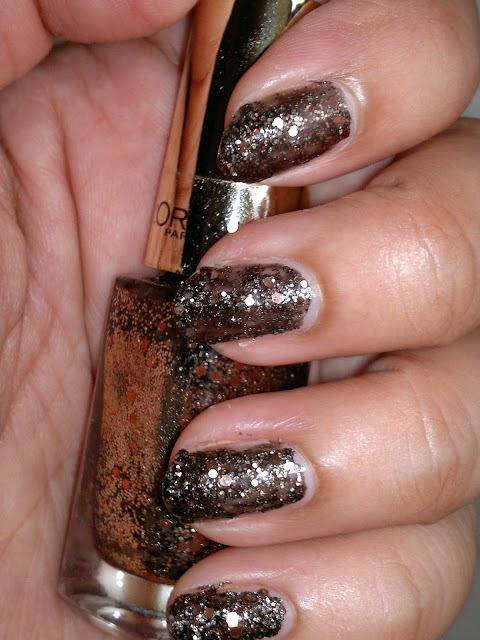 Once it dried, I applied a top coat to seal and set the glitters. I have been wearing this nail paint for four days now and it has showed a little bit of tip wear on my ring finger nail. Rest all are as good as freshly painted nails. Product rating: A+, available at all L'oreal Paris counters and online shopping websites. 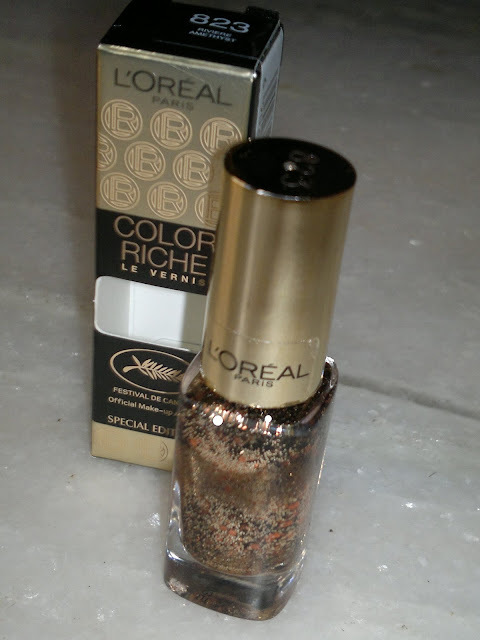 Would highly recommend L'oreal Paris Special Edition Festival de Cannes Color Riche Le Vernis to one and all. There are four shades in all and everyone would find one that suits best to them. 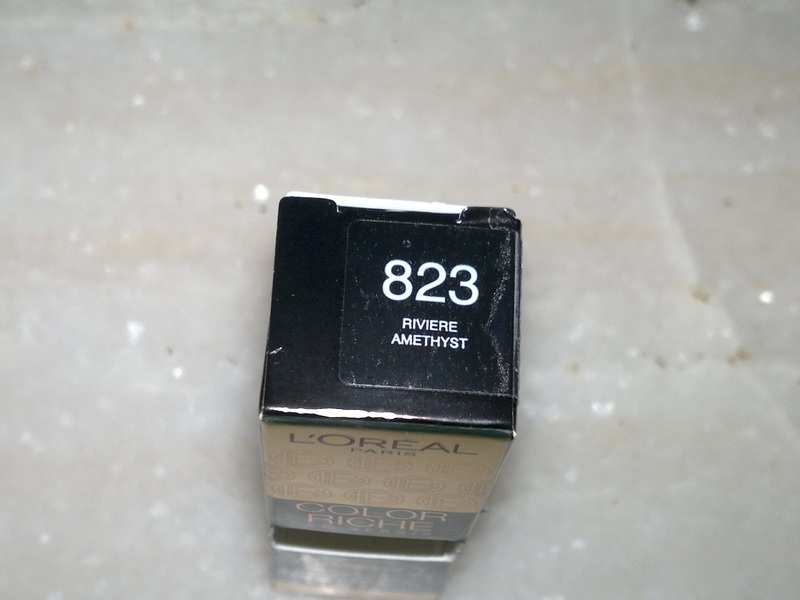 Have you tried L'oreal Paris Special Edition Festival de Cannes Color Riche Le Vernis in Riviere Amethyst? Do share your comments below.